WHY CHOOSE SUYI ALUMINUM ALLOY SWIVEL SET? 1. Wide eye openings can accommodate multiple carabiners. 2. Made from hot forged with large bearings and heat treated, stainless steel axles. 3. Super Tire Swings, Disc Swings, Web Swings, Chair Swings or Hammock Swings etc. Use indoors or outdoors. 4. 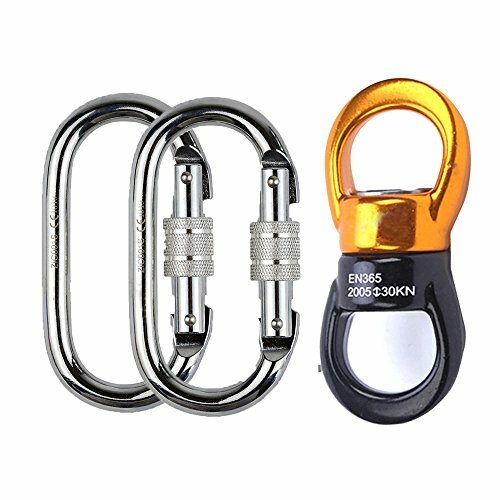 This Safety Rotational Device clips can be used with any hanging swing. 5. Placed between a load and either rope or cable, the twister avoids severe rope twisting while the load turns. 6. Rotation is an important part of many therapy activities, our safety rotational device features a solid aluminum body with smooth roller bearings for free rotation. 7. This heavy-duty swing spinner is the ideal way to upgrade your swing by turning it into a super-smooth spinning machine. - For using with static and dynamic ropes placed between a load and either rope or cable. - Can be rotated 360 degree, and the rope does not twist knot. - Wide eye openings can fit for multiple carabiners. - Material: Hot forging aluminum magnesium alloy, strong and durable. - Ideal for swing setting, aerial dance, chairs, hammocks, aerial skills, or anywhere you need dependable, smooth rotation without twisting chains or ropes. HIGH QUALITY -- Hot Forging Aluminum Magnesium Alloy, Strong and Durable. Totally Silent, Frictionless 360°Free Rotation with Sealed Ball Bearings, Very Compact and Symmetrical Swivel. INDUSTRIAL-GRADE SWIVEL DESIGNED -- No Jerky, Start/Stop Spinning, Provides Unrestricted Movement with Smooth Swivel action. Works with Any Swing, Makes Any Swing Spin Smoothly. No More Twisted Ropes or Chains. Any Swing Spin Smoothly. No More Twisted Ropes or Chains. GREAT WAY TO UPGRADE YOUR SWING -- For Using with Static and Dynamic Ropes Placed Between a Load and Either Rope or Cable, Can Be Rotated 360 degree, and The Rope Does Not Twist Knot. POPULAR FOR ALL KINDS OF RIGGING AND HANGING -- Ideal for Swing Setting, Aerial Dance, Hanging Chairs, Hammock Swings, Aerial Skills, Tire Swings, Disc Swings, Web Swings or Anywhere You Need Dependable. WIDELY USED AND SAFE -- Use Indoors or Outdoors.30kN (6,750lbs.) breaking strength tested, 2,000lbs. recommended working load limit.